Why buy a Wi-Fi router for your internet, and a separate firewall for security when you can do it all with the D-Fend router? Now you can enjoy high-speed, data-intensive activities like streaming HD video and online gaming without sacrificing your privacy and security. The D-Fend router goes beyond ordinary antivirus protection by integrating powerful smart home protection, parental controls, and antivirus in one router. From connected thermostats to baby monitors, D-Fend lets you protect every connected device – even those that can’t install antivirus software. D-Fend brings advanced cloud-based machine learning into your home. It constantly updates its threat database to protect you in real-time. High-speed AC2600 Wi-Fi with MU-MIMO and a 1.6 GHz Intel® GRX350 processor lets you handle all your Wi-Fi and network security needs with no compromise in performance. Unlike ordinary antivirus protection, D-Fend gives you a comprehensive, customizable system to help keep your kids safe online. D-Fend works with Amazon™ Alexa™ to give you a new way to command and monitor your home network – your voice. Give your home network an extra layer of powerful protection with the D-Fend AC2600 Wi-Fi Router. Stop hackers and malware at the router-level, way before they can come close to your connected devices. D-Fend harnesses the power of McAfee Secure Home Platform to automatically protect all your connected home devices. Protect your family’s online privacy through a home router with built-in D-Fend protection. 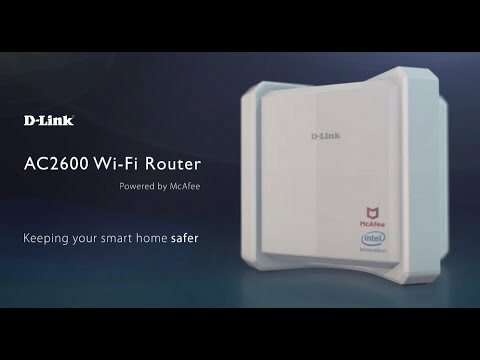 With D-Fend AC2600 Wi-Fi Router, you get free, advanced internet protection with McAfee® Secure Home Platform, and McAfee® LiveSafe™. Give your family the best in internet protection for years to come.